Side dish: Do Young complains about a dry throat after his unsettling meeting with Woo Jin, and decides to take a nap. Perhaps, he would have felt better having a Juicy Lucy Burger, which is a twist on the typical cheeseburger. Honest and naive Nam Da Jung (Kim So Eun) has managed to smuggle $100,000 past sinister Kang Do Young (Shin Sun Rok). She quickly uses the microphone to warn Do Young’s teammates that he will betray them, and offers to help them. Do Young can only sit back and laugh in disbelief. Back in the West nation, genius ex-convict Ha Woo Jin (Lee Sang Yoon) turns to teammates, former loan shark, Jo Dal Goo (Jo Jae Yun) and evil Jamie (Lee El). Surprisingly, it is Dal Goo who he identifies as Do Young’s accomplice. 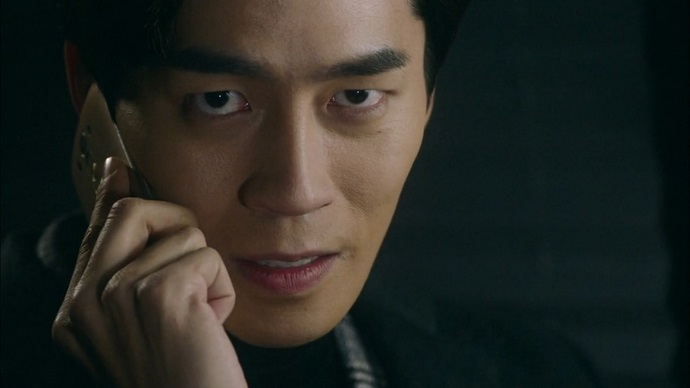 To circumvent Dal Goo and Do Young’s secret communication, Woo Jin’s note to Da Jung had directed her to add $5000 to the agreed upon smuggling amount. However, an angry Da Jung decided to pack away the allowable maximum. Dal Goo falls to his knees and apologizes for betraying his teammates. As Da Jung guesses, Dal Goo was convinced to double cross his team in order to save her from the game. She is quick to forgive and comfort him. Even Jamie screeches that Dal Goo is not at fault, but rather, Do Young is, and Woo Jin agrees. Dal Goo is busy inflicting physical punishment on himself when Woo Jin steps in and picks him up. Woo Jin must then comfort a weeping Dal Goo. 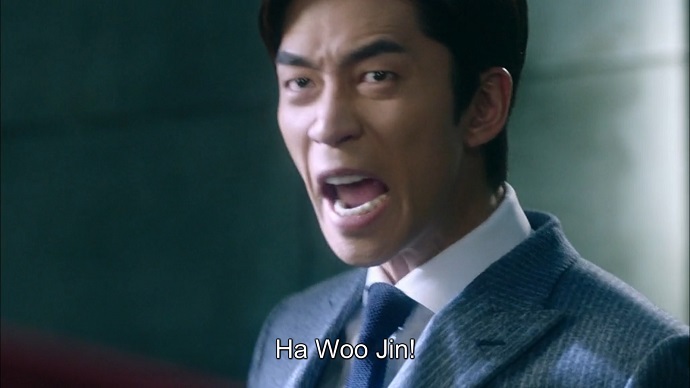 On the plus side, Woo Jin notes, they are finally a real team, and he has a plan. 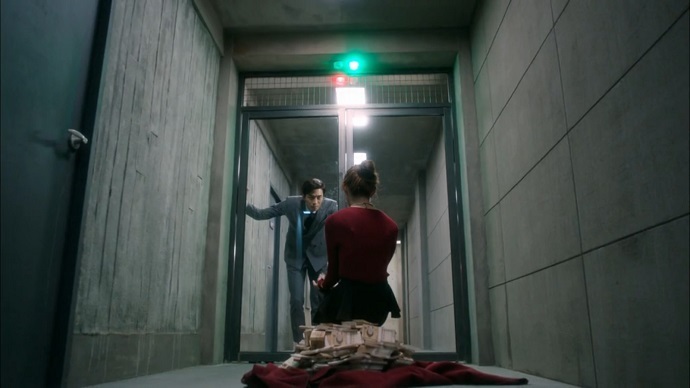 Woo Jin proposes withdrawing all the money and hiding it somewhere between the ATM and the inspection room. A collaborator in the East nation would move the money during their smuggling round, thereby bypassing inspection. Jamie wonders who on the other team would trust them, and Woo Jin proposes that they give the collaborator their bank cards as collateral. When Jamie asks what is in it for her, Woo Jin allows her to keep her own bank card, which will be the only one they use to smuggle. When the question of who will recruit a collaborator comes up, everyone turns to Da Jung. Meanwhile, in the East nation, the seeds of doubt about Do Young have already by sown by Da Jung’s outburst. Hacker, Choi Sung Hoon (Lee Shi Hoo) questions Dal Goo’s amazing winning streak, and the gangster and washed-up actor have to agree that it is suspicious. They hush up just as Do Young returns. As the inspector, Da Jung makes her pitch to Sung Hoon. She challenges the idea that Do Young will return their bank cards to him and his teammates. Sung Hoon concedes that he is suspicious of Do Young, then hears out the plan. Da Jung promises to share the winnings with all of them and the three men agree to join forces with the West nation. Do Young catches on that something is amiss pretty quickly, noticing the gangster making hand signals, and that the inspection with Da Jung took a while. He decides to serve as inspector again, and everyone is worried that Do Young will never relinquish the role. Woo Jin proceeds with withdrawal of all their funds and hides it in an air vent. He then enters the inspection room. When Do Young notes that he is late, Woo Jin distracts him by positing that micro-expressions cannot be completely suppressed, even by someone who has emptied himself of emotion. Woo Jin asks Do Young if he was an orphan, and Do Young refuses to answer, claiming that he does not find the subject fun. 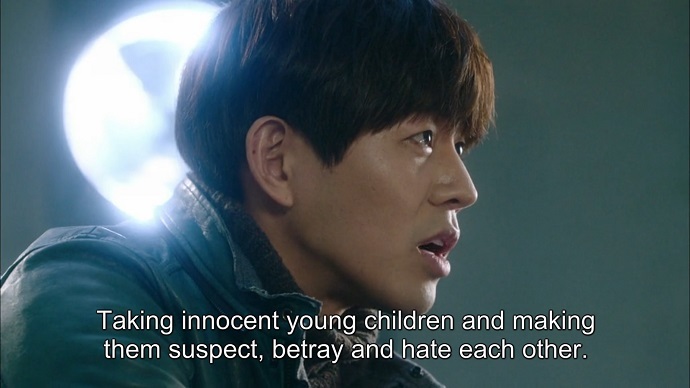 Woo Jin then asks Do Young if he grew up in Walden Two, referring to a notorious experiment that took children and made them turn on each other. When Woo Jin infers that Do Young is a product of the experiment, Do Young loses his cool. Woo Jin observes that Do Young is human after all. Do Young decides to stop Woo Jin for inspection and guesses that he has $100,000 in his possession. Of course, Woo Jin has an empty case. The East nation teammates are creeped out by the mere visuals of the exchange between Woo Jin and Do Young, and feel relieved by their choice to switch sides. Do Young storms in and throws a tantrum before deciding to take a nap, leaving the inspection and smuggling to Sung Hoon, the gangster and the actor. Da Jung directs the three co-conspirators to the hidden cache of money. Time is running out and it is uncertain when Do Young will literally wake up to their betrayal. The actor takes the three bank cards from Da Jung, but when he returns, Do Young is waiting rather than sleeping. He threatens to burn the bank cards of his team mates if they betray him. “Liar Game” PD, Lee Yoon Joo (Cha Soo Yeon) feels the need to intervene via microphone, and Broadcast Station Director Jang (Choi Jin Ho) directs the East nation smuggler to proceed. Do Young laughs manically. 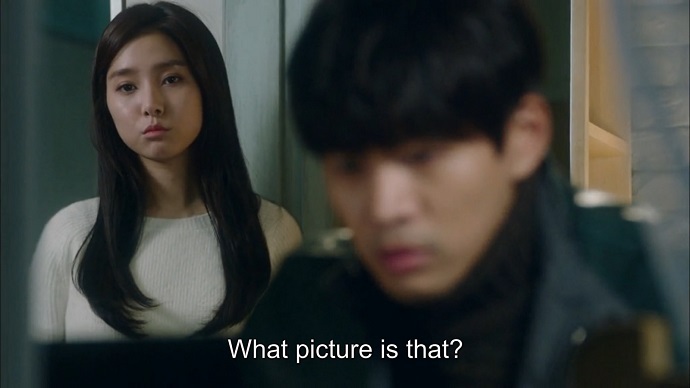 Now, even Director Jang is creeped out. The East nation collaborators proceed with Woo Jin’s plan, but they are on pins and needles around a rapidly unraveling Do Young. Sure enough, Do Young catches on to his teammates being in possession of multiple bank cards, and figures out the plan. Holding a lighter threateningly to six bank cards, Do Young claims that he will just get Jamie to betray them. Do Young assumes the inspector role, and Jamie volunteers to face him. Do Young reveals to her that he is in possession of six bank cards. An annoyed Jamie points out that he would have received the money even if he lost, but Do Young wants to have it all. He then proposes that Jamie join the winning side. The West nation team is already celebrating their win over Do Young. Woo Jin then notices how dejected their East nation collaborators are. When Jamie returns, he questions her, but she denies that anything happened during her exchange with Do Young. Thereafter, it is a series of passes on both sides. Do Young then ruins all the bank cards with a magnet, and asks a TV crew member to provide useless reissue cards, before laughing in the dejected faces of his team mates. In the final turn, Do Young is the inspector, and Jamie volunteers to be the smuggler. Woo Jin only gives her a knowing look. After moving the money, Jamie is complaining about her aching shoulder to Do Young who gives her three reissued bank cards, supposedly as compensation. Do Young proposes celebrating their win on camera. The East nation team are horrified by the gloating of Jamie and Do Young on the monitor, but can do nothing. Meanwhile, Director Jang and PD Lee know that Do Young has betrayed Jamie, making him the sole survivor of Smuggling Game. Suddenly, PD Lee’s attention is called to the corridor outside the inspection room. The cameras are trained on Do Young as he goes into the corridor and spots the pile of money on the West nation side of the divide. Jamie explains that she found the bag too heavy to carry over to the East nation side. Do Young is shocked, and everyone else is thrilled. Only Woo Jin and Sung Hoon realize that there are three more chances for East nation to smuggle. 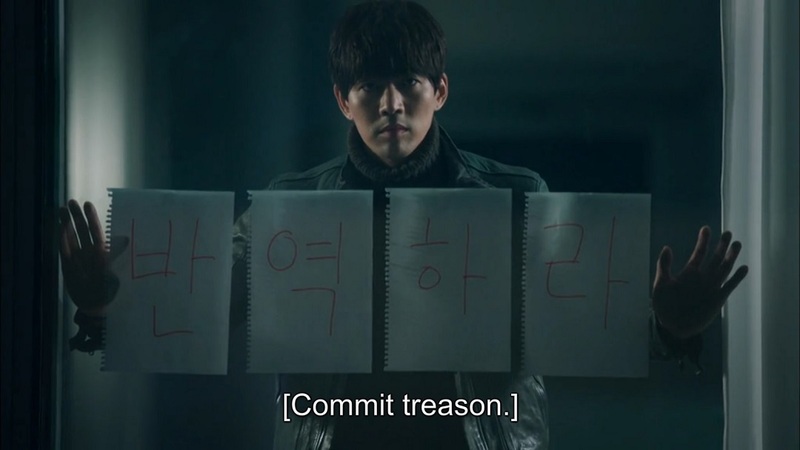 Woo Jin quickly writes out a message directing the East nation to commit treason. The East nation members rush to the door and prevent Do Young from entering. Do Young is left in limbo as the clock counts down on his final opportunity to smuggle. 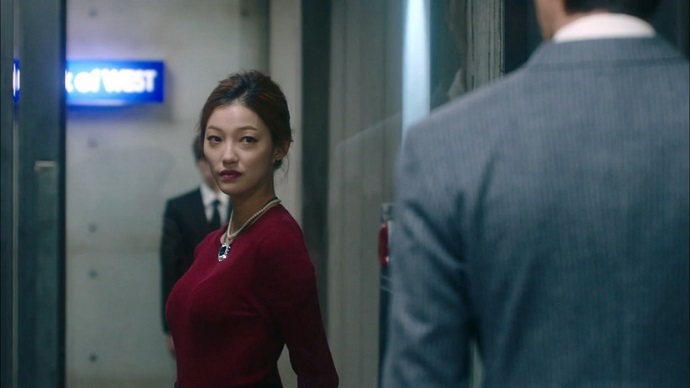 In flashback, it is revealed that Woo Jin had voiced his suspicion that Jamie would betray them, and she did not deny it. Dal Goo threatens her with physical violence when Da Jung stops him, and leaves it in Jamie’s hands; it will be Jamie’s choice what kind of person she chooses to be. Jamie is in disbelief that Da Jung managed to bewitch her into betraying Do Young. The East nation smuggling opportunity runs out of time, Smuggling Game is done, and West nation wins. Da Jung openly attributes the win to Jamie who is uncomfortable with the adulation. Do Young kills the mood by pointing out that he is still the winner of Smuggling Game since he won the most money. The East nation collaborators and Jamie will get nothing in spite of Da Jung’s promise to give the money away. Da Jung points out that Do Young’s belief that money rules people has been proven wrong by the collaboration of East and West nations. Do Young compliments Da Jung on her personal development before going to the ATM to withdraw his winnings. He finds all the bank cards in his possession are invalid. Woo Jin announces that he had already reissued the bank cards before Do Young made the same move. Hence, Woo Jin has the real bank cards in his hand. Do Young irritably throws his reissue cards over his shoulder. When Do Young and Woo Jin are alone, Do Young reveals that he has planted a destructive idea in Da Jung’s head. Woo Jin threatens him right back. Jamie is teetering on her high heels while struggling with her suitcase of cash when Dal Goo’s car stops beside her. Da Jung offers her a ride, Dal Goo seconds the notion, and Woo Jin doesn’t object. Jamie gets into the car, and bickers with Dal Goo. Meanwhile, Sung Hoon is having BBQ and soju with the gangster and actor. The two older men consider forfeiting the game. Sung Hoon is about to leave in frustration at giving Do Young a free pass to the finals when the other two change their minds, and vow to continue. After dinner at Da Jung’s home, Woo Jin asks to use her computer, and finally accesses the USB memory stick that Sung Hoon had slipped him. Woo Jin discovers that the foreign company rumoured to be a potential buyer of the jvN broadcasting station is connected to Do Young. Previously, Do Young’s investment company’s stock had shot up when it was rumoured that they would take over L Company. Woo Jin’s eyes widen as he views a photo of him and his mother in front of the orphanage she supported, with a standoffish Do Young posing beside them. Da Jung’s asks about the photo, and Woo Jin hurriedly closes the file. 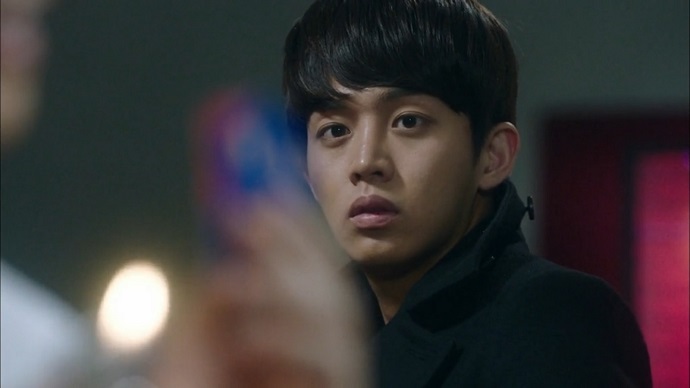 Da Jung brings up Do Young’s claim that Woo Jin was responsible for her father’s debt. Woo Jin says nothing, choosing to put the conversation off until tomorrow evening when he will reveal his relationship with Do Young. Meanwhile, Sung Hoon is jostled by a man as he enters his building elevator. The elevator has already climbed to the 10th floor when he receives a threatening call from Do Young. The elevator suddenly drops, Sung Hoon screams, and there appears to be a crash at the ground floor. PD Lee reviews documents provided by Do Young that reveal Woo Jin’s hand in ruining L Company. Director Kang is in favour of dropping this bomb on air. PD Lee is against the idea, but cites technical issues as the reason. Director Kang disputes her claims; it turns out that a sound recording of Da Jung’s father exists. As promised, Woo Jin shows up at Da Jung’s place of work. He arrives just as Da Jung is watching the broadcast of “Liar Game” and learns about his hand in her father’s debt and attempted suicide. Woo Jin walks away without announcing his arrival, and receives a call from Do Young taunting him with riddles. Woo Jin angrily asks how he is connected to him and his mother. Do Young then refers to the true face of his angelic mother. Woo Jin struggles to understand as Do Young glowers. I was lead to believe that “Liar Game” would be 10 episodes long. So, when I recently discovered that it would be 12 episodes, it was quite possibly the first time that I have wholeheartedly welcomed an extension. Like the rest of the series, this episode was jam packed with plot twists and good pacing, but with the added bonus of watching Do Young go insane. Episode 10 was full of surprises. Most shocking was Do Young committing murder. I can only hope that, by some miracle, Sung Hoon survived the elevator fall, or Do Young was bluffing. Otherwise, this show is more ruthless than I expected. Was anyone else amazed at how nice Woo Jin was to Dal Goo after his betrayal was revealed? 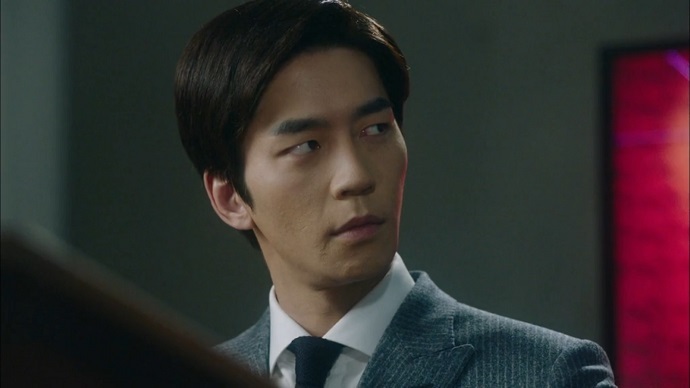 Having been presented with his mean streak at the beginning of the series, I suppose the expectation is that Woo Jin would soften over time under Da Jung’s influence. Still, Woo Jin holding a crying Dal Goo was a pleasant surprise, and probably the closest we will get to skinship on this show. I am also amazed at how little Da Jung annoys me now. I credit her anger and defiance of Do Young for tempering her saccharine sweetness. Plus, she continues to prove that she can be useful, even in a game of deception. 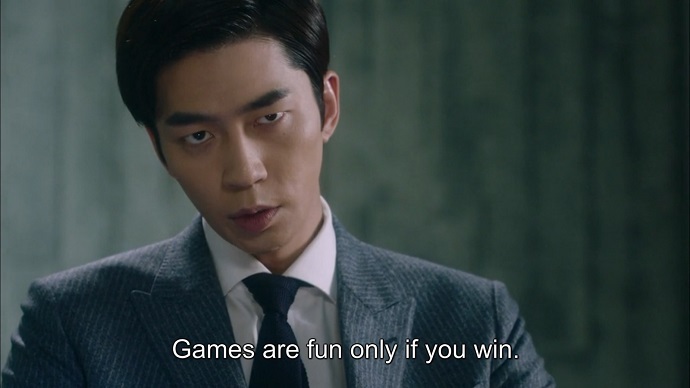 One final note: I had to repress the urge to screen capture Shin Sung Rok non-stop. He was incredibly creepy, and dominated every scene he was in. Still, viewers probably do not need still images of Do Young’s crazy seared into their memory, so I’ll just present you with one of his more animated moments. 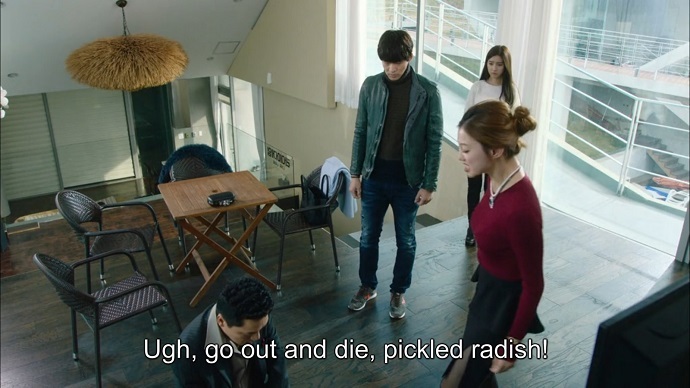 I always think I’m missing K-drama news, because it gets lost in translation. In this case, I think you’re right; it was supposed to be 10 episodes. However, they were definitely informed of the extension far enough in advance that it doesn’t feel like an extension. yep! 😀 I’m so glad there’s an extension, but at the same time, I’m dreading the episode 12 (today) GAH! It’s so good I don’t want it to finish, but they ended episode 11 with such a cliffhanger that I HAVE to watch it!! !